Just keep the ring positioned so the focal item is within the groove. use this quality grooved gauging your stone set rings. warning: keep away from children. not a toy. your risk from exposure to these chemicals varies, depending on how often you do this type of work. The SE JT-SP214 13" Grooved and Marked Ring Mandrel is marked with sizes 1-16 in quarter-sized increments. Just keep the ring positioned so the focal item is within the groove. Use this quality grooved mandrel to gauge and resize your stone set rings. Our ring sizer is the perfect for jewelers, ring makers, ring sellers and everyday users. 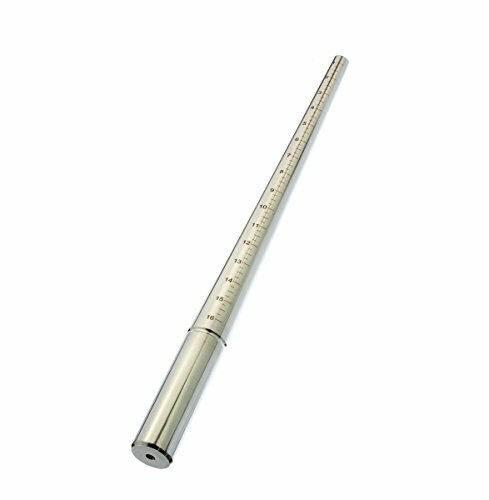 This 13" ring sizer mandrel is laser marked and comes in a plastic case. This item features sizes 1-16 with 1/4 resolution and is 1.875 lbs. Warning:Keep away from children. This is not a toy. Warning:Some dust created by power sanding, sawing, grinding, drilling, and other construction activities contains chemicals known to the state of California to cause cancer and birth defects or other reproductive harm. Some examples of these chemicals are: lead from lead-based paints, crystalline silica from bricks and cement and other masonry products, and arsenic and chromium from chemically treated lumber. Your risk from exposure to these chemicals varies, depending on how often you do this type of work. To reduce your exposure, work in a well-ventilated area and with approved safety equipment, such as dust masks that are specially designed to filter out microscopic particles. SE is committed to providing the customer with the best possible source for value. You will enjoy the quality, function, and usefulness our SE JT-SP214 13" Grooved and Marked Ring Mandrel has to offer. Important:Avoid getting counterfeit items. Genuine SE products come with our SE logo on the packaging. SE is a registered trademark protected by US trademark law.